It’s time to meet the star of the show! We consider our Oreo to be a very special raccoon, because he is one of few tame and handleable raccoons living in the UK. 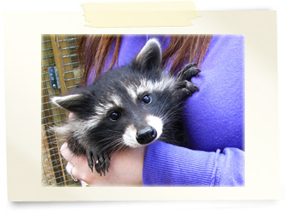 Oreo is also a very lucky raccoon, because when he was a baby he survived against the odds. When he was born his mother failed to produce milk, leaving Oreo and his littermates without food. 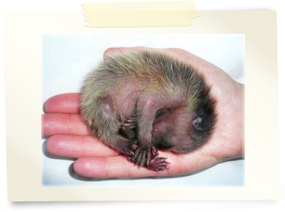 Oreo came to us at just two days old, and we took on the job of hand rearing him – this meant round the clock feedings and lots of stress and worry! His chances of survival were so small, but day after day Oreo continued to defy the odds, and before long he was out of the woods! Thankfully, Oreo has since grown up into a healthy, happy and well-adjusted raccoon. He has the best of both worlds – firstly, he shares his home with other raccoons and so is able to be sociable with others of his kind. But also, due to his unconventional upbringing, Oreo is equally comfortable spending his time with humans as well. Oreo is a very laid back and tolerant raccoon, and is naturally friendly, playful and loving to everyone he meets. Nothing phases this boy! 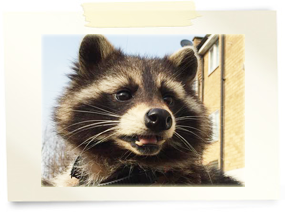 He loves to climb his way up to your shoulder and give you one of his special raccoon head massages – that’s after he’s had a rustle around in your handbag on the hunt for food and toys! His secret weakness is belly rubs, and he loves being treated to (or helping himself to) the occasional grape or marshmellow. 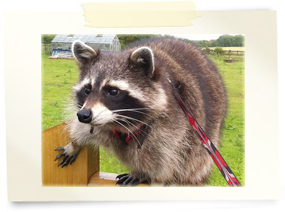 He truly is a one of a kind raccoon, and his unique ability to interact, entertain and ultimately educate is what led to Oreo becoming the inspiration behind Oreo and Friends – you can read more about that on our about us page, if you like! Our Oreo has always been popular, but he’s become a bit of an A-lister these days! Before he was even a year old, he’d already been featured in newspapers, photoshoots, and even television and radio! As his popularity grew, he was even chosen to be the cover star for Ben Fogle’s book, The Accidental Naturalist! Even after all this, it wasn’t until Oreo struck up a very special friendship that his career really skyrocketed. 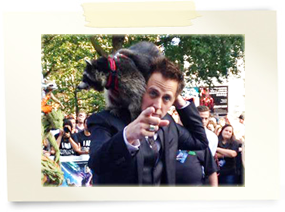 That friendship was with renowned movie director James Gunn, after James got in touch with us and invited Oreo to be the reference raccoon for the character of Rocket Raccoon, in his movie Guardians of the Galaxy! Oreo’s movements, expressions and behaviour were studied by the movie’s animation and design team to help them create the movie’s most beloved character, and our little man loved every second! Oreo was invited to tour the set, meet the cast, and even accompanied James Gunn to the European premiere! Oreo adored James, and still considers him a great friend to this day! You can read more about Oreo’s amazing Guardians of the Galaxy experience on this page, if you like! Our beloved little man is clearly going places, but his favourite thing still is, and always will be, making new friends and teaching people about exotic animal care. He really is one incredible little raccoon! Our raccoons are probably the most well known and well loved of all our animals. Feel free to head on over to our booking page if you’re looking to become a raccoon fan yourself!